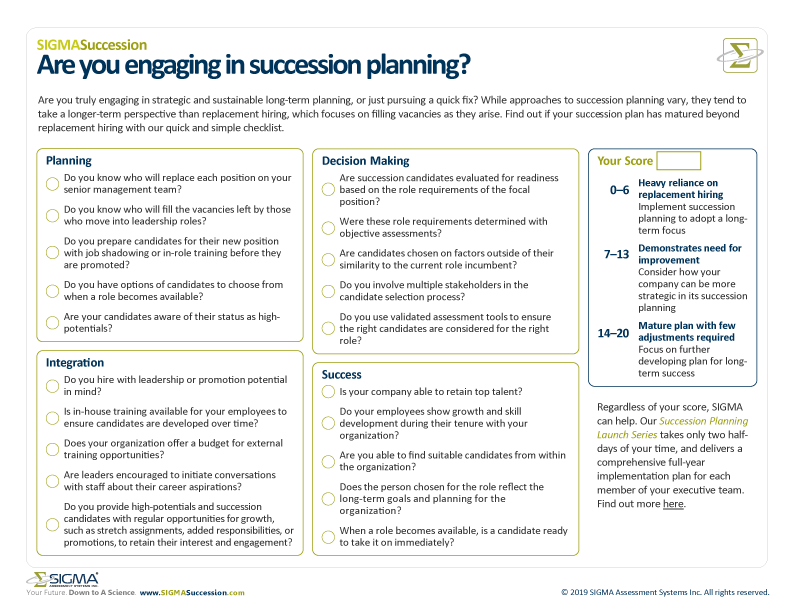 Use this Replacement Hiring Checklist to find out how successfully your company is using succession planning. When asked about their succession planning process, many companies think they’re on track if they are able to fill vacancies when they arise. However, replacement hiring is the not the same as succession planning. Succession planning takes a long-term approach to talent management whereas replacement hiring is reactionary and occurs only when there is an immediate need. We’ve put together a checklist that will help you to identify if your organization is engaging in strategic long-term planning, or settling for a quick fix. CLICK HERE TO DOWNLOAD OUR REPLACEMENT HIRING CHECKLIST AND EVALUATE HOW YOUR SUCCESSION PLANNING PROCESS STACKS UP. Click here to learn more about the differences between succession planning and replacement hiring. At SIGMA, we want to help your company be more effective and proactive with a good succession plan. For more information on our SIMPLE Succession Process, Launch Series , or Succession Planning solutions, contact us and learn more about how we can help your organization develop your next generation of talent.